The majority of the antique lumbers and woods we sell, including our wide plank flooring and paneling, is reclaimed from barn structures that are 100-200 years old. Although we look for barn frames that are in good enough shape to rebuild at other locations as barns or barn homes, many times we get what we call "parts barns". They are too far gone to either rehab or rebuild. We purchase and dismantle what is left of these dying structures on a regular basis for the siding, spare beams, flooring, rafters, grainery wood and floor joist that are still salvageable and would otherwise simply fall down and rot over time. 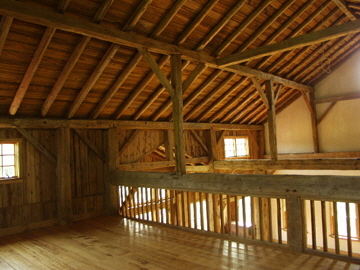 We also acquire lumbers from factories, warehouses, schools, and other industrial structures, and resaw them into beautiful flooring or paneling, particularly long leaf yellow pine (heart pine) and doug fir, that were used so prevalently when they constructed many of these early 20th Century buildings. We are not a large- assembly- line - supplier of these kinds of woods and try to give individual attention to each custom order. There are so many different looks that one can achieve with antique woods that years ago we coined the phrase "The Many Faces of Antique Woods". Give us a piece of weathered white pine barn siding for example, and we will produce over half a dozen different and distinctive looks from the same stock. Using both sides, and then a combination of wire brushing, planing and sanding to different levels, can produce a wide range of looks from very formal and finished to very primitive and rustic. On our lumber orders, we take the time to discuss all these options with you, send you custom made samples, and make every attempt to provide you with the exact "face" you are looking for. Of course, there will always be a certain level of variation in these lumbers, and happily so, for this is one of vintage lumbers' most charming attributes. All these woods feature varying degrees of deep, beautiful colors and a rich patina that can only be bestowed by time. Many of these aged woods and timbers came from first growth trees in America, which also tend to have a tighter grain, which means a harder and stronger lumber. Our beautiful honey colored white pine, also known as pumpkin pine, is much denser and heavier than the new paler white pine that is available today. We rarely kiln dry these woods - but we can if you prefer - and have found that if air dried and accumulated to their new surroundings properly, going to the additional expense and time to kiln dry these woods is unnecessary, even when building kitchen cabinets. We don't have a huge warehouse and a high end shop full of very expensive mass production wood working equipment, so we are able to keep our prices very reasonable, particularly compared to some of the large lumber suppliers in this country. And we custom make every order. Before you pick an antique lumber supplier we invite you to compare our products and prices and how we can service you. 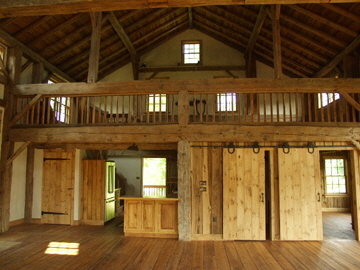 During the past three and a half decades, we have managed the dismantle of well over a 1000 barns and other early structures, several hundred of which have been rebuilt into barns, barn homes, log homes, art galleries, additions to existing houses and other creative uses. Each structure is marked, photographed, and a scaled drawing is created before dismantling begins. During the dismantling process, the roof, siding, rafters, and flooring are carefully removed by hand to be reused. To prevent breaking or damaging of the fine joinery, the wooden pins that hold the mortise and tenon joinery together are driven out or drilled. The barn frame is then braced and a crane is brought in at this point to carefully remove small sections of the barn frame - in the exact opposite way it was put up - and lay them on the ground for final disassembly. We have developed a large network of other folks in the dismantling business, particularly in Canada, and we now currently import many of our barn frames and lumbers from there. We bring these frames to our shop to do any repairs, cleaning and final tune up before shipping them to their new owner. We find the barn frames in Canada to generally be superior than most American frames due to the very large sized timbers they tend to use more regularly there. Perhaps they had more large timber stands, or perhaps they built barns stronger due to heavy snow loads, but generally speaking, we find the frames from Canada better suited for rebuilding as barns or barn - home conversions. (See what makes a good barn frame). Our shop is right over the Canadian border which also makes it convenient. 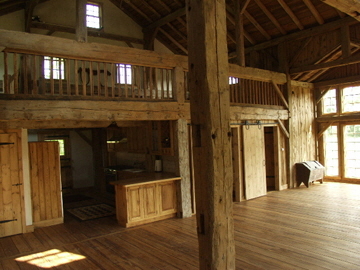 Today, Dale Lehmer and Antique Woods specialize in locating spectacular historic barn frames and other early structures, and then working with clients on a step by step basis in the design, management and, in some cases, the entire construction of these projects. We have crews that will come to your site anywhere in America to reconstruct the frames (which we recommend) and work with you on other aspects of your home conversion project, particularly anything related to supplying and installing vintage lumbers. Dale himself always accompanies his crew for these barn raisings. Many times we sell our barn frames before we get them listed on our web page and this is a good way to get a really great barn. Call us and talk with Dale about your needs and he will help you determine approximately what size-range frame might suit your project building plans. He will then e-mail you pictures of any barns we get that are within that range and give you an opportunity to discuss the possibility of purchasing it before we list it on our web page. Really great frames often don’t last long on our web site and we generally sell only a limited number per year - perhaps a dozen or so. There are only a handful of individuals in America that have three and a half decades of experience working full time exclusively with barns, barn home conversions, log house and vintage lumbers. Dale Lehmer is one of them. As with life itself, nothing teaches better than experience. Before you decide on a barn company, we invite you to compare our pricing with some of the other very reputable barn companies with comparable experience in this field. 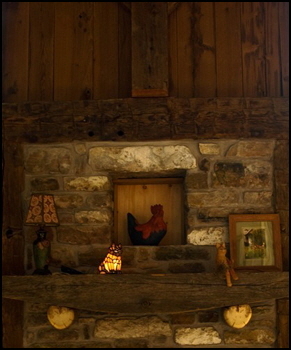 Also, please visit one of our other web sites www.vintagewoods.com - that provides a lot of information about our cost effective and affordable ways of incorporating a barn frame into your new home. Particularly take a look at its section on working with "responsible tolerance" and "cost saving measures". We have always taken pride in keeping our pricing "unpricy" but still providing excellent professional products and services.